In my effort to be conscious of the amount of carbs I consume daily, one thing I’m learning to substitute [and love] is “spiralized” veggies for traditional pasta. One of my favorite dishes growing up was my mom’s beef stroganoff made with beef tips cooked to perfection and loaded with her creamy mushroom sauce. Well I recently took the liberty to cut back on the cream and “punch up” the flavor for a slightly, sweet quick weeknight meal. So grab your skillet and wooden spoon. Let’s get cookin’! Heat skillet with olive oil over medium heat. Then add mushrooms and cook for 8-10 minutes or until tender and browned. Remove mushrooms and set aside. Add butter to skillet and allow to melt. Once butter has melted, add onions and saute for 3 minutes. Add ground beef, water, bullion cubes, and Worcestershire sauce to skillet. Cook mixture until beef is browned and thoroughly cooked. Add lemon juice, paprika, and mushrooms to skillet and stir, mixing well. Bring to a simmer then remove pan from heat. Stir in sour cream. Add salt and pepper to taste, if needed. To prevent curdling, do not heat on stove once you’ve added the sour cream. 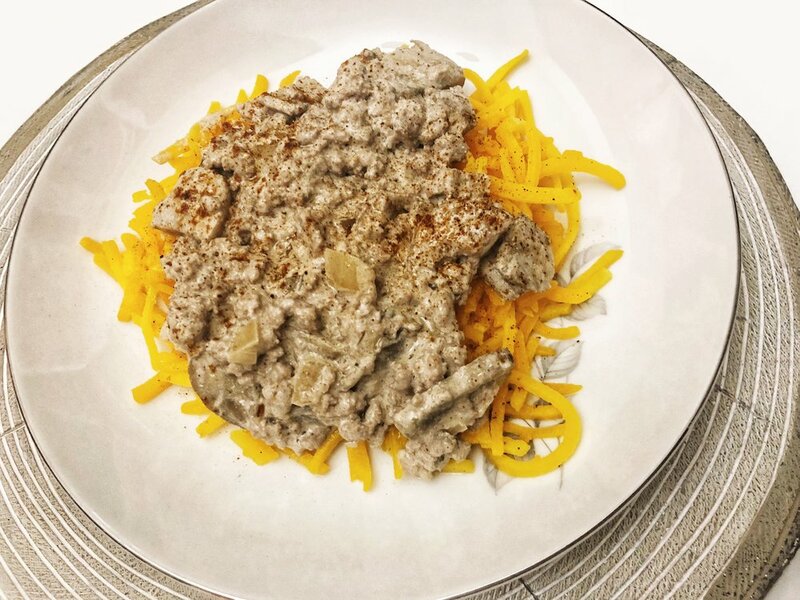 I served my stroganoff over butternut squash that I sauteed in a skillet with a teaspoon of olive oil and a dash of sea salt. You already know….I sprinkled a bit of smoked paprika on top. You may serve the stroganoff by itself or over pasta or toasted bread slices. Give this quick and easy skillet dish a try. Come back and let me know how you liked & served it.